The four sculptures that appeared in Providence’s Kennedy Plaza in February are the perfect introduction to Peruko Ccopacatty’s work: a human form, shaped from ribbons of stainless steel. A shimmering angel, assembled from reclaimed car bumpers. Two llamas, composed of papery metal sheets. Even beyond the hours that went into realizing these pieces in his West Kingston studio, this installation was a long time in the making; Ccopacatty had waited 20 years to showcase his work in the heart of the capital. Dreams are important to Ccopacatty, whose career has taken incredible turns in his decades-long career. He grew up in an Andean village in Peru, descended from the indigenous Aymara people. Ccopacatty spent many years studying sculpture, but no medium attracted him like metal. Ccopacatty met his wife in Peru, and followed her back to her native Rhode Island to make a life as a working artist. Ccopacatty’s studio is built into a converted schoolhouse, where the former classrooms are packed with impressionistic statuettes. His yard is a veritable museum of larger work, many of them visible from the road. 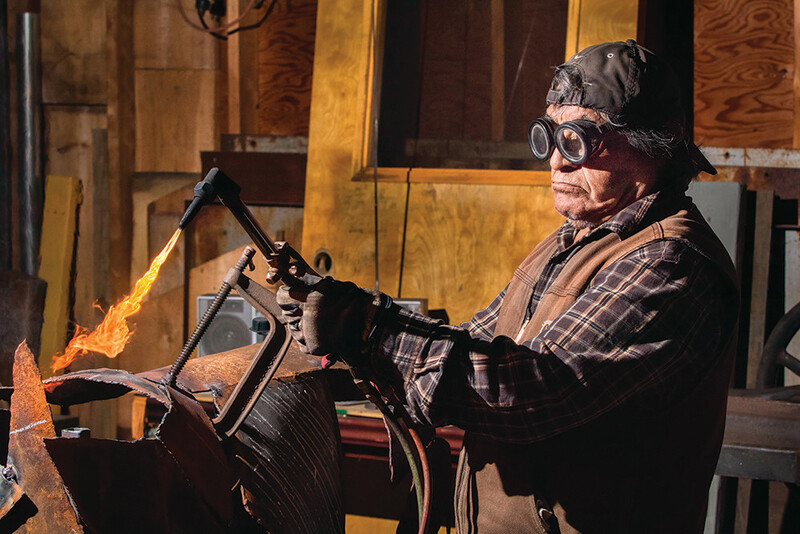 While Ccopacatty’s work is celebrated throughout the US and his native Peru, he lives a quiet life, soldering his masterpieces together in the tranquil isolation of South County. But this most recent installation in Providence has been of particular interest to the local community, and a point of pride for Ccopacatty. He originally proposed a sculpture, called “Generations,” in 1995. Several human figures would be walking together, each representing a different age. Ccopacatty specializes in living forms, usually in dynamic motion – laborers working, men running, women with arms outstretched – and “Generations” would exemplify that image. The installation was delayed. Years marched by, yet Ccopacatty never gave up hope. This winter, through a partnership between Providence-based public art program The Avenue Concept and RIPTA, the the first figure went up in the plaza, along with some of his other works. February 4 was declared “Ccopacatty Day,” and the two-decade-old dream started to be realized. Still, the project isn’t yet complete, and the aging sculptor can think of little else.